Call centres face the challenge of living up to rising customer service expectations, without blowing their budget. Companies that embrace emerging call centre technologies and customer centric processes that make them effective will continue to enjoy a competitive edge. The call centre is going through an exciting and speedy transformation, quite unprecedented in its long history. Emerging technologies, changing consumer behaviours, and fierce competition present new challenges and exciting opportunities for managers. The following list of call centre trends will help shape your support strategy in the coming year and beyond. Cloud-based infrastructure is the fastest growing area in the call centre industry, which DMG Consulting predicts will almost double between 2013 and 2015. The proportion of call centres seats in the cloud will reach 18% by this time, up from just 2.2% in 2008. Global smartphone shipments are expected to jump this year by 25% according to Digitimes Research, By 2015, IDC expects more US consumers will access the internet through smartphones than PC’s. Forrester reports that 68% of call centre decision makers believe mobile integration is a high priority for the long-term success of their customer relationships. They predict this trend will grow the number and sophistication of mobile customer service vendors in 2013. Gamification promises to make the workplace more fun by applying game design elements to business processes such as customer support, and it’s quickly gaining traction. Gartner predicts that over 70% of Global 2000 companies will have incorporated some form of gamification by 2014. When it comes to improving customer interaction, a whopping 38% of call centre managers say that measuring results are one of their biggest challenges. Call centres are notorious for implementing many different technologies, which can make reporting difficult, convoluted and time consuming. Video is making its way to the call centre thanks to the amount and detail of information it provides customers. In fact, 18% of managers plan to introduce or upgrade this emerging technology in the next two years. Call-back technology is finally getting the mainstream acceptance it deserves. In fact, according to a Forrester study, 75% of consumers said they would likely use it, more than any other emerging call centre technology. Speech analytics measure how a caller feels by analyzing the tone, speed, and loudness of their voice. This helps companies automatically prioritise callers based on what emotions are detected. Cloud and IP telephony developments have given rise to the virtual call centre, and 41% of enterprise contact centres plan on employing work-at-home agents in the near future. Driven by economic pressures and commoditised services, call centres are using the customer experience landscape to differentiate themselves. A recent survey, sponsored by Avaya, shows that 80% of customer service organisations identify customer experience as one of their top two goals. Social media has fundamentally disrupted the call centre. When customers are frustrated with a phone support experience, 16% will share it on sites like Twitter, which can be disastrous to a company’s brand. 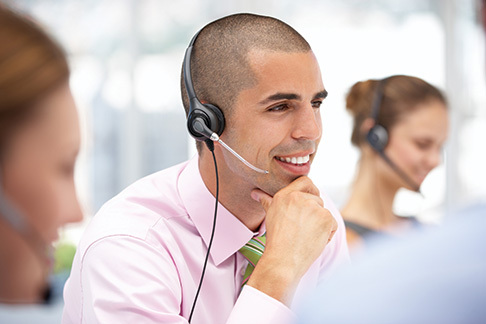 We recognise the importance of call centres in all businesses. Whether you have one sales person answering calls or a 500 seat centre your needs are the same – maximise business opportunities and improve the customer experience. Our products are built with these needs in mind and we encourage you to get in touch with us so we can develop a solution for your business.